We also stock a wide range of goods from Namaste UK, a fair trade company. Colourful scarves and blankets, lanterns, ceramics, beautifully crafted in India, Thailand and Nepal. Fantastic, ethically sourced goods, they all make great gifts. 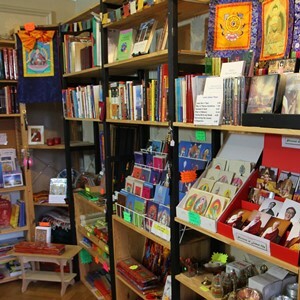 You can visit Kagyu Ling shop whenever the centre in Manchester is open. We take card payments as well as cash and cheques. We also bring an extensive selection of goods from the shop to all the teachings given in Manchester by Lama Jampa Thaye during the year. If you would like to order any items to be brought to the teachings venue for you, please email the shop team at kagyuling.shop@dechen.org. All profits from the shop go towards helping maintain and develop Kagyu Ling.